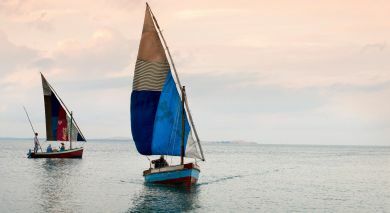 Experience authentic island life at Pemba! Situated at the tip of the Pemba Bay, the town forms a base for planes and boats traveling to the Quirimbas Archipelago. Visit the authentic local market or Souk for handicrafts and traditional silverware. The Muslim quarter, known as Paquitequette, has hundreds of traditional houses made from coral rock, mud and thatch. It slopes down a hill onto the beach where you can see lots of colourful fishing dhows on the sand and in the sea. The cobbled streets lined with dilapidated colonial buildings have their own special charm, and the Pemba Bay boasts idyllic beaches perfect for swimming! Nestling amongst swaying palm trees on the shores of the tropical Indian Ocean, is the magnificent Pemba Beach Resort Hotel.